My Mac & Cheese Attack….. | Cape May Antiques Inc.
My Mac & Cheese Attack…..
Mac and cheese attack (with ham)…I just had to do it! Boil pot of water and add pasta. Cook for just 6 minutes. While waiting for the pot to boil. Saute 1/2 of thinly chopped onion in 2 tablespoons of butter plus drizzle of olive oil (about 2 tablespoons). Once onions are opaque, add 3 heaping tablespoons of flower to make your rue. Stir around the flower and saute for about 1 minute. Then add 1 cup of chicken stock, 1 cup of milk (I actually used low fat), a tablespoon of dijon mustard and I added a splash of white wine (optional and by splash I mean 1/4 cup). Bring the liquid to a boil whisking to remove any lumps from the flower. This should start to thicken in a few moments….as it thickens, reduce heat and add 2 bags of shredded cheese. I used sharp cheddar but feel free to mix different types of cheese. Once it thickens and cheese is absorbed into the mixture, take pot off heat. By then your pasta will be done, drain well. Mix pasta and mixture well. I added the pre-cooked ham in diced pieces at this time. 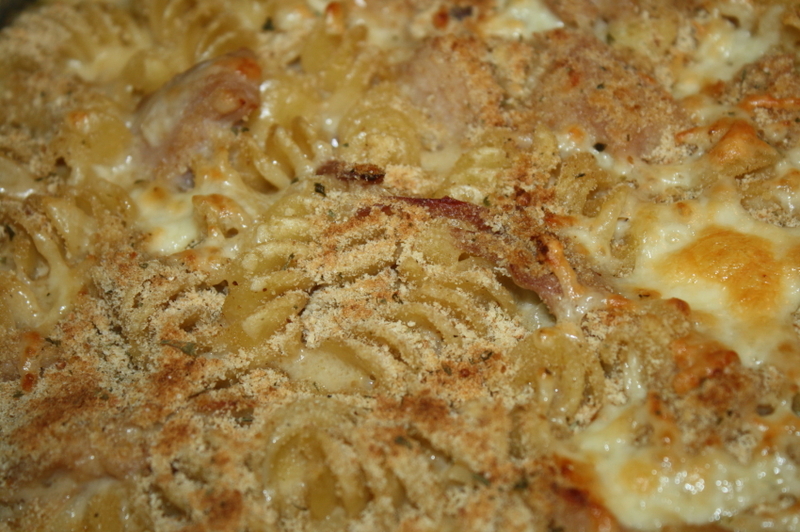 Transfer to large casserole dish, sprinkle top with bread crumbs and more cheese. Stick under broiler for about 3 to 5 minutes until cheese melts on top and bread crumbs brown….wait for it….ahh..now dive in once it cools. Enjoy!